In case you feel like you’ve been here before, you’re not wrong. Audiophiles who like to share audio files will remember Napster making a name for itself in 1999 and the early 2000′s and subsequently bowing out again by 2002, only to come back from the dead in 2003. It now looks as though the music service won’t be cheating death a second time around however. The original Napster was the creation of one Shawn Fanning, a 19 year-old student who wanted to create a way of sharing MP3 tracks with his friends. His peer to peer sharing software, was for a time an internet sensation, but once the free exchange of music started cutting profits off from the recording industry, it came under heavy fire. The RIAA (Recording Industry Association of America) filed a lawsuit in April of 2000 as part of the Digital Millennium Copyright, in an effort to take the service offline. Artists such as Metallica and Dr. Dre openly opposed the service too, Dre going so far as to file a lawsuit of his own. The resultant actions Napster had to take by blocking the sharing of unauthorized files took all the steam out of the service and as a result it died a death in 2002 after media giant Bertelsmann’s attempted to buy it for a reported $9 million. 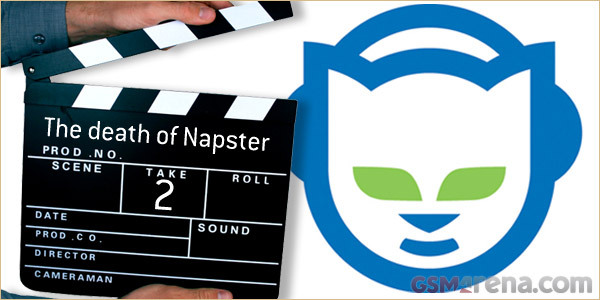 Similar services in the meantime rose and fell to legal action such as Kazaa and LimeWire, but Napster appeared back on the scene in 2003 under new owners Roxio, (typically known for their CD and DVD-burning wares), who picked up the company for $5 million in bankruptcy court. Despite the relaunch, the service was a shadow of its former self and didn’t really make anymore waves in its new form. Best Buy stepped in to utilize the music service for their own needs, apparently forking over a cool $121 million to take it off Roxio’s hands, but this is where the train ride had to stop. Despite the amount being undisclosed, it’s safe to say that Best Buy’s investment probably didn’t pay off when they recently sold the service on to one of the Web’s oldest music subscription services, Rhapsody and that’s it. Rhapsody have seemingly absorbed the once well-loved music service into its own infrastructure without so much as a whisper and unless it can somehow pull the same trick again and rise from the dead, its unlikely we’ll be seeing the name Napster on the inter-webs peddling its music services ever again. R.I.P. Did you use the service in it’s original form or it’s newer incarnations and does it bother you in the slightest. Let us know in the comments. Click here to see what’s left of Napster.com.